1. Ask your managers when the last time the machine was cleaned and sanitized. 2. Check the last time the water filter was changed. Or is the filter on bypass altogether? 3. Do you have bakery items prepared in your restaurant operations? 1. Most of our partner OEMs recommend at least a quarterly cleaning and sanitizing of ice machines. Depending on the water hardness, it could be needed more frequently. These recommendations, done alone, often recognize the additional risk of bacteria and cysts that occur naturally in water and thrive in an ice machine. Open the front panel and if you see pink or black spots, it’s time for a cleaning. 2. 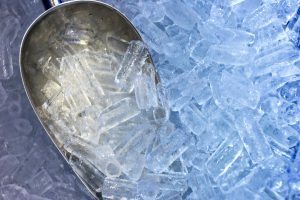 In addition to improving clarity and taste of ice, water filtration can mitigate scale and bacterial growth in an ice machine. If your water filter isn’t changed at least twice a year, you’re increasing the risk to flavor, food safety and break downs of your ice machine. 3. Yeast and flour easily aerate in a warm, highly active environment such as a restaurant. Those particles will end up in your ice machine and will grow with time and exponentially increase your food safety risk. 1. Find a reputable service company to help eliminate your need to manage the ice machine risk and keep your focus on your menu and business. The service company should always guarantee their work and build a program that’s based on their experience, the manufacturing of the equipment and your facility’s unique needs. 2. Ensure your program with your service company includes water filtration. Have the service agent test your water and recommend the right filter and frequency based on the water hardness. 3. If your operation has yeast or flour, ask your service agent to review and adjust your frequency of cleaning based on the visual inspection of bacterial growth. Remember, lots of pink or black spots are indicative of increasing the frequency of cleaning.